Scott Gibbs was a Welsh international who played for his country and Great Britain in both codes. His two stand-out career moments in Union came when he was named Player of the Series against South Africa in 1997 on the Lions tour and scoring a superb solo try in the last minute in a 32-31 win against England at Wembley to prevent Martin Johnson's team winning the Grand Slam. 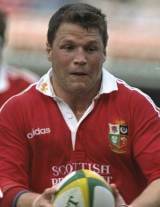 He made his Wales Union debut in 1991 and made the British and Irish Lions tour to New Zealand in 1993. Gibbs was selected for the final two tests ahead of England captain Will Carling. In 1994 he switched to play for St Helens but returned once Union had gone professional and in 1996 he played for Swansea for the second time in his career. He made it onto the Lions tour of South Africa in 1997 and made some critical challenges and some punishing runs from inside-centre. These performances saw him take the 'Player of the Series' and the Lions took the series 2-1. Gibbs also represented Wales at the 1999 World Cup and he scored a try against Japan in the pool stages. In 2001 Gibbs had the rare achievement of making his third Lions tour but did not make a Test appearance. He made his final Test appearance before the Lions tour when Wales beat Italy 33-23 in Rome in the Six Nations. He retired from all forms of rugby in 2004 and is now a commentator on television.